A day off for the ages folks. Both fun and productive which is a good combination since its usually one or the other. Or neither. Anyway, the day started with Karin and I getting to sleep late. The new nurse impressed us enough yesterday that we felt confident enough we didn’t need to be hovering over her today. Karin came back to bed after greeting her and we got a few restful hours. Liam finally fell back asleep for the nurse around 8:30am after being awake most of the night and we new he’d be done for until the afternoon. After leisurely making breakfast and checking emails Karin and I took advantage of our nursing situation and left the house together. Let me say that again, really let it wash over you this time. Karin and I were able to leave the house together and spend a few hours out there in the world. We went to the gym and worked out together before going out to lunch. It was fun and calming and we both needed it. After lunch I took the christmas lights off of the house and attempted to clean the leaves from the yard that I wasn’t able to get before the first snow. That’s when I realized I didn’t have a rake, only a leaf blower, and even though the snow is gone most of the leaves are still frozen to the ground. “Mission leaf-clean-up” was quickly abandoned in favor of “Mission cup-of-coffee-on-the-couch”. A mission that I was well suited for and accomplished with relish. Already one of my more productive days, I wasn’t done yet. At about 3pm my father came over and we got to work on finishing up some shelving units we built for my basement. There is still some unpacking work to be done down there but I’m better prepared for it now. Hey, give us time, we only moved in 8 months ago! Dad finished up our last project and I organized a spot for our next. My father has given me his two Epson 3000 Color Printers. Fickle machines they are, one will be used for parts. 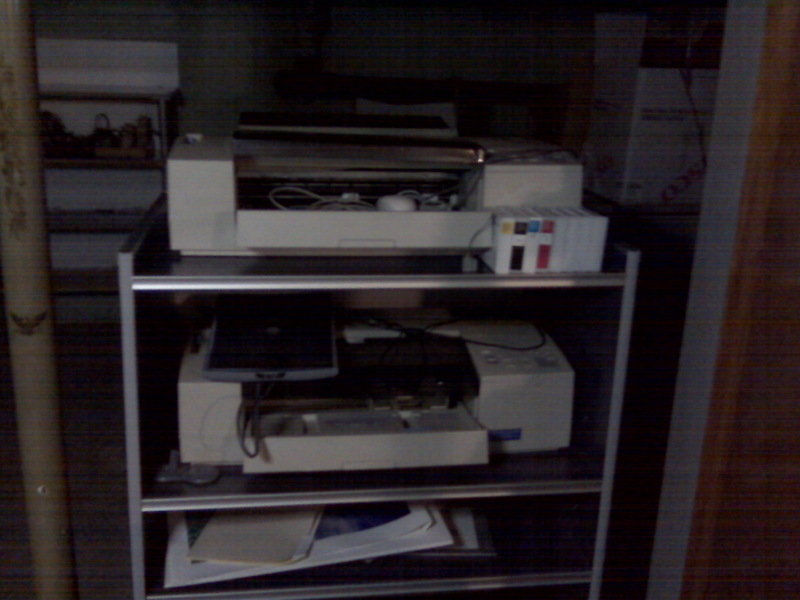 A beast of a printer, it needs some cleaning but I can’t wait to get it up and running. I feel like Gutenberg and I’m ready to start my own print shop. Producing my own prints has already gotten me excited about photography again. I needed a place to put my new equipment and so my dad and I built another shelving unit for it and in the process put together a small office space for it in the basement. I can’t wait to get started. My mom came by as we were finishing up and my parents got to spend some time with a decidedly sleepy little boy. The day was capped with an excellent shepherd’s pie made by The Wife and watching TV while holding my boy who of course woke up ready to play at about 10:30 at night. I’m beginning to think that we have spawned a vampire. Not a sparkly girly Twilight vampire but a badass tough guy vampire like in Lost Boys. I’m on team Liam. Now who’s got something that needs printing? ← Its all about Liam.